It’s a pretty nasty weather day here. Snow, sleet, and freezing rain. Ugh. I don’t know about you, but I am ready for summer! I bought some awesome looking strawberries this week to make something Valentine’s Day-ish. I originally wanted to dip them in chocolate, but since I’m missing the warm weather right about now, I thought I’d go a different route with these strawberries. How about a strawberry salad…on a stick? That should make it feel a bit less winter-y. 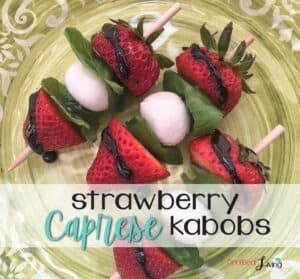 This is a quick and easy kabob appetizer that can be put together in minutes, and perfect for any summer get together…or when you want to pretend it’s summer! It’s a fun twist on a traditional Caprese salad that replaces tomatoes with strawberries. The strawberries pair wonderfully with the rich balsamic glaze and fresh basil. Please note that the warm balsamic glaze will melt the mozzarella on contact. To avoid that, drizzle the glaze only over the strawberries. I hope this brings a warm front to your part of the world. Let me know if you give it a try! Fresh strawberries, mozzarella and basil come together with a drizzle of balsamic vinegar in this quick and healthy appetizer. Thread the top half of one strawberry onto a wooden skewer with the hull facing up. Next, fold one basil leaf in half, dark side facing out, and add it to the skewer. Add one mini mozzarella ball, followed by another folded basil leaf, and the bottom half of the strawberry. Repeat Step 1 with the remaining strawberries, basil, and mozzarella until you have 16 skewers. Prepare the glaze by adding the balsamic vinegar to a small saute pan over medium high heat. Cook, stirring frequently, until the vinegar is reduced to about 1/3 of its original volume. Remove glaze from heat and let cool slightly. Drizzle over the skewers, along with the olive oil, if desired. Serve immediately. Join the Cool Bean Living email list below to be the first to know when new articles, blogs, recipes and announcements are made.